IT’S ONE OF the more bizarre stories to come from the banking inquiry so far. Representatives of Libyan dictator Muammar Gaddafi’s government met with officials from the Irish government in 2010 to discuss Libya buying a huge stake in Bank of Ireland. However they pulled out of the deal because he didn’t feel ‘comfortable’ with Ireland’s finances at the time which were mired in the depth of the financial crisis. The story was revealed in what was otherwise routine questioning of John Corrigan, the former head of the NTMA, on Wednesday. Fianna Fáil TD Michael McGrath asked Corrigan about a note in his evidence to the inquiry about how the Libyan Investment Authority initially approached Bank of Ireland in November 2010 and the bank told the NTMA about it. “We felt this was an issue worth pursuing,” Corrigan told the inquiry. The NTMA asked the Department of Foreign Affairs if it was ok to go ahead with the talks with the Libyans and Corrigan said they were given the all clear. NTMA officials travelled to Libya and spent a day discussing the plan, which would have seen Libya make a €1.4 billion investment in the bank, including €1 billion in preference shares and around €400 million – the market value – for 24% of the ordinary shares in Bank of Ireland. However the Libyans were uncomfortable with Ireland’s precarious financial situation. “The whole discussion concentrated around a possible third round of recapitalisation [for Ireland] and in the event… they pulled out of it,” Corrigan said. “From their point of view it was probably a clever decision not to proceed with it,” he said. “And so Colonel Gaddafi didn’t quite almost own a good share in Bank of Ireland?,” Michael McGrath said with a bemused tone. Corrigan said that it was a deal worth examining at the time, regardless of what happened in Libya afterwards. “I know we can look at this with the benefit of handsight of what’s happened in Libya, but certainly the Libyan Investment Authority were a very highly regarded sovereign investment fund and had a very substantial diversified portfolio of investments globally,” Corrigan said. 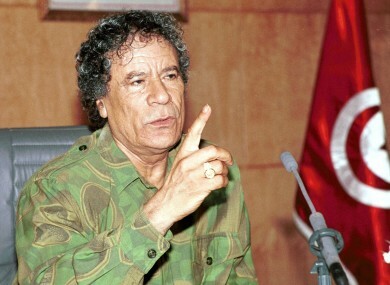 Email “The bizarre story of how Gaddafi almost bought a big chunk of Bank of Ireland”. Feedback on “The bizarre story of how Gaddafi almost bought a big chunk of Bank of Ireland”.